Post-it and other brands of sticky notes are put to good use everyday by teachers and students. The Post-it website has a page filled with resources for teachers, and they have a really cool iOS app for digitizing, sorting, and sharing square sticky notes. Those small pieces of paper that can be attached, easily removed, and repositioned can be even more useful when you print on them. While there is a printer designed to print sticky notes, you can send sticky notes through the printer you already have. You’ll need a template for printing, and I just so happen to have one for you. Skip ahead to see loads of ideas for printed sticky notes. The template is in Google Slides. Why Google Slides? It’s one of my favorite design tools, and does not have to be limited to slideshows. The template has a custom page setup of 8.5 by 11 inches to match standard printer paper. I’m sharing the file in a way that forces you to make your own copy. You can edit your copy and use Google Slides’ design tools to print your personalized design. Get a copy of the basic template for 3 inch by 3 inch notes. Get a copy of the basic template for 2 inch by 1.5 inch notes. Click a link for a template above (or scroll to one below) and click the Make a Copy button. Click the field under Pages and enter 1-1. Affix one note into the center of each box. Ensure that the sticky side is at the top and will go into the printer first. Affixing notes sideways or upside down will cause a printer jam. Go to the second slide of the template. 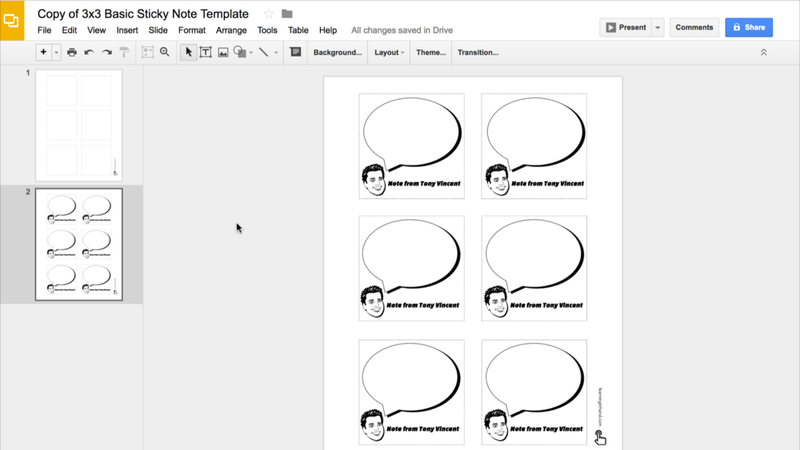 Use Google Slides’ text and drawing tools to design what you want printed on each note. Be sure the design fits inside of the box. Leave a small margin on each side. If you want to print multiple copies of the same note, select everything you put into the note. Click Arrange → Group. Then Edit → Duplicate. Move the duplicate position it inside the next box. Duplicate and position again and again until all the boxes are filled. Insert the paper to which you’ve affixed the sticky notes. For most printers you’ll place the paper with the sticky notes on the bottom. Other printers will need the paper loaded with the stickies face up. You will be sure which way they’ll need to face after you print. Remember that the adhesive end of the notes need to go into the printer first. In Google Slides click File → Print Settings and Preview. Click the Hide Background button. Click the field under Pages and enter 2-2. Yes, sometimes the notes are not perfectly aligned on the paper. But they still look great. After printing you might notice some things you’d like to change. Make your edits and print another batch. Remove the sticky notes from the guide paper so that you can reuse it. Affix a new blank note into the center of each box. Follow the “Print your design” directions again. Hold down shift and an arrow key for precise positioning in Google Slides. Try having a shape or image go beyond the note’s edge. This is called a bleed. Black and white designs tend to look best on brightly colored sticky notes. Get free simple icons to use on your sticky notes from The Noun Project. Get free colorful clipart to use on your sticky notes from Open Clipart. Use the Bitmoji Chrome extension to add your personalized avatar to your sticky notes. Emoji character might not print correctly. If they don’t, copy and paste the graphic emojis you find at emojipedia.org. Colorful designs and photos look best on white sticky notes. For some reason, white notes are difficult to find. You can order white sticky notes from Amazon. They have 3 inch x 3 inch Post-it brand notes. I'm on the lookout for white 1.5 inch x 2 inch sticky notes. I bought RediTag brand notes. Unfortunately, these notes are too smooth and smear in the printer. It's probably because they are made from sugar cane. Below are some examples of what you could print on sticky notes with Google Slides. Print them as they are, make modifications, or use them for inspiration. Design a sticky note with a speech bubble, your name, and a picture. Print and keep handy for when you need to write a note to a student, parent, or colleague. It's personalized stationary on a sticky! Get a copy of the my personalized note template for 3 inch x 3 inch sticky notes. Change the name and picture to make it your own. Keep some printed Reminder notes on hand to use when you need to write yourself or someone else a friendly reminder. You can change the text in the title to anything, perhaps Don't Forget, Suggestion, Notice, or Warning. Get a copy of the Reminder Note template for 3 inch x 3 inch sticky notes. Print a note with lines to write tasks. Check the box when the task is complete. You can change the title "To Do" to be more specific. Additionally, you could replace the lines with text and print a ready-made to do list—like a list of tasks for students to complete before turning in a project. Get a copy of the To Do template for 3 inch x 3 inch sticky notes. Check in with students to learn about how they feel before, during, or after a lesson. Students can affix this sticky to an assignment before turning it in. Get a copy of the Today I Feel template for 3 inch x 3 inch sticky notes. A student can write a goal and keep it affixed to his or her desk, notebook, folder, etc. You can change the title of "Today's Goal" to anything you'd like. Perhaps "This Week's Goal," "Reading Goal," or "Project Goal." Get a copy of the Today's Goal template for 3 inch x 3 inch sticky notes. Put cartoons with your customized avatar onto sticky notes! You can make your own Bitmoji avatar using the Bitmoji Chrome extension. With the extension, you simple drag and drop cartoons into a Google Slide document. Read more about the extension. These look best when printed in color on white sticky notes. White stickies are not very common, but you can order them on Amazon. Get a copy of my Bitmoji template for 3 inch x 3 inch sticky notes. Replace my cartoons with your own. Print a note where you can fill it in like a Twitter message. There's a spot for an avatar drawing, username, time, and message. This could be an interesting way to communicate with students and colleauges. Get a copy of the Paper Tweet template for 3 inch x 3 inch sticky notes. Print a sticky with the roles you want students to take on during group work. Groups can write names next to each role as a reminder for themselves as they work. The note can be affixed to an assignment or placed in a learning journal for reference. You can change the text of the group roles to match the labels you use in your classroom. Get a copy of the Group Roles template for 3 inch x 3 inch sticky notes. Student might not remember what each editing mark means. Attach this sticky note to an edited paper as a reminder. Get a copy of the Editing Marks template for 3 inch x 3 inch sticky notes. Print a reference for students to use while writing. This list of transitions words and phrases can be affixed to computers, desks, or notebooks for handy reference while writing. These look best when printed in color on white sticky notes. White stickies are not very common, but you can order them on Amazon. Get a copy of the Transitions Chart template for 3 inch x 3 inch sticky notes. So you've got a student who finished his or her work before everyone else. Return their work with a sticky note that lists options of what that student can do next. You can change the text to customize the list. Get a copy of the Done Early template for 3 inch x 3 inch sticky notes. Students can affix this sticky note to an assignment before turning it in. It can help them reflect on the effort they put into their work, and serves as a reminder to keep trying, even when things become difficult. Get a copy of the Rate How Hard You Tried template for 3 inch by 3 inch sticky notes. Have pre-printed sticky notes ready to go for students when they are thoughtfully reading. When they make connections to the text, they can checkmark the kind of connection and write about it on a sticky note. Stickies can be affixes to the pages where the connections were made. Get a copy of the Text Connection template for 3 inch x 3 inch sticky notes. Students can circle emojis to indicate how they feel after a lesson. Students could affix the stickies to papers they turn in. Or, they could stick it to the door as they leave the room. These notes look best when printed in color on white sticky notes. White stickies are not very common, but you can order them on Amazon. Get a copy of the Emoji Exit Ticket template for 3 inch by 3 inch sticky notes. Students can keep this note handy for sentence starters when sharing their opinions with others. These phrases are useful whether students are communicating in person or online. Get a copy of the Opinion Phrases template for 3 inch x 3 inch sticky notes. Print a QR code on a sticky note. Students can scan the code with an app or website so they do not have to type in a web address. You can create QR codes individually at goqr.me (or through various other apps and extensions), or you can generate QR codes in batches at qrexplore.com. Get a copy of my example QR code template for 3 inch by 3 inch sticky notes. Fraction bars help students find equivalent fractions. Print some fraction bar sticky notes for students to use when they need them. Students can shade the bars and affix the sticky to their papers to show their work. Get a copy of the Fraction Bars template for 3 inch x 3 inch sticky notes. Liquid Measurement Reference sticky notes are an example of making a small version of a poster or anchor chart available to students. The reference can be affixed to textbooks, notebooks, desks, or computers so they are readily available when needed. Liquid Measurement Reference notes look best when printed in color on white sticky notes. White stickies are not very common, but you can order them on Amazon. Get a copy of the Liquid Measurement Reference template for 3 inch by 3 inch sticky notes. Print up a batch of encouraging sticky notes. You can affix them to a students' work or students' desks to promote a growth mindset. This template uses smaller sticky notes to fit 18 on one printed paper. I printed my encouraging notes on these colorful sticky notes from Amazon. Amazon links on this page are affiliate links. Purchasing through these link do not cost you anything, and you can help support this website by making purchases through those links.